Far and Wild Safaris will collect you from the O R Tambo International Airport or from your overnight accommodation in Johannesburg and travel through the Highveld industrial, mining and agricultural areas. Our guide will make this section interesting, adding value to the drive with his interpretation of the local history and sights. The scenery is pretty flat but changes as we approach the Drakensberg Escarpment, where we drop down to the Lowveld through scenic passes. 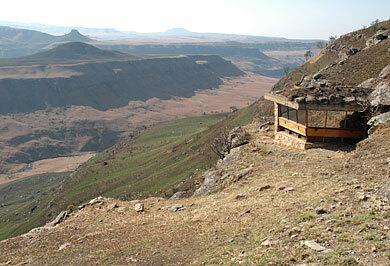 This Drakensberg Escarpment area has scenic vistas over the Lowveld of the Kruger National Park. The fresh mountain scenery and panoramic views over the Klein Drakensberg escarpment are quite spectacular and give the area its name of 'Panorama Route'. The geology and climate of this high rainfall plateau results in numerous waterfalls. Some are hidden deep within some of the largest man-made forestry plantations in the world, with row upon row of pine and eucalyptus trees. We will visit the Panorama Escarpment and some of the view-sites such as God's Window, Blyde River Canyon, Berlin and Lisbon waterfalls, etc. and overnight at Hannah Lodge (or similar). Hannah located on a game reserve with a variety of antelope. After breakfast we drive through to the nearby Kruger National Park. The world-renowned Kruger National Park offers a wildlife experience that ranks among the best in Africa. Established in 1898 to protect the wildlife of the South African Lowveld, this national park of nearly 2 million hectares, is unrivalled in the diversity of its life forms and a world leader in advanced environmental management techniques and policies. Truly the flagship of the South African national parks, Kruger Park is home to an impressive number of species: 336 trees, 49 fish, 34 amphibians, 114 reptiles, 507 birds and 147 mammals. Kruger Park is an excellent game viewing venue, normally with good sightings of lion, elephant, giraffe, zebra, wildebeest, warthog, baboon, monkey, hippo and impala regularly seen. The more elusive animals like leopard and wild dog are an exciting find. 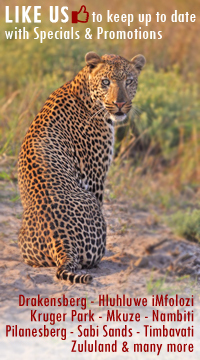 You will go on a sunset drive in an open safari vehicle with ranges of the Park on one of the evenings, this to enhance the possibility of seeing the nocturnal species such as leopard, lion, hyena, genet, bush babies and then the other nocturnal animals such as the smaller cats, owls and nightjars. These drives are conducted by SANParks, the organisation tasked with running this Park. 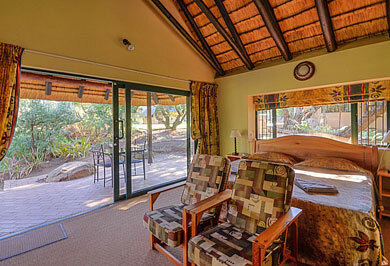 We will spend our nights in Kruger in bungalow accommodation, at camps inside the Kruger Park. Although not graded, these bungalows are of a two or three star standard. Here the rooms have twin beds, each with a private shower, toilet and hand basin en-suite. The brick under thatch rooms are equipped with air-conditioning, some also with ceiling fans and a fridge. There is insect proof screening on the doors and windows. You will be provided with bath and hand towels as well as soap. 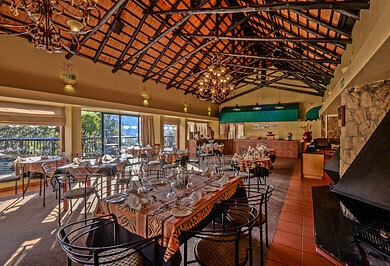 In the game reserve we will have breakfast and dinners in the restaurants. We enjoy a full game-viewing programme for the balance of the days. Your guide in his vehicle conducts the remainder of the game drives. We encourage an early start to make the most of the best time of day to view the animals. We will try and be the first one out at dawn - this to see if we are able to sight a roadside kill or some of the nocturnal predators returning to their daytime resting place and then to have breakfasts, possibly at different camps. After our morning game drive and breakfast we make our way to a nearby Private Game Reserve, arriving in time for lunch and your afternoon/evening game drive. Please note that there are many lodges to choose from, and lodges will be chosen in conjunction with your input. Today we follow the lodge programme, which includes a morning game drive, breakfast, sometimes a guided walk (if available and which is optional), lunch, afternoon tea followed by the evening game drive and dinner. After our morning game viewing we leave the Sabi Sands and travel to Swaziland. We visit the Ngwenya Glass Factory before making our way to Reilly's Rock (or similar). 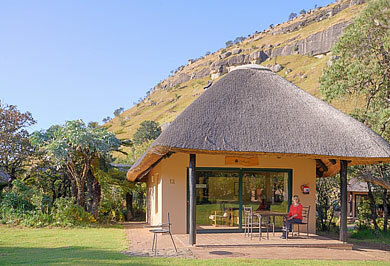 Situated in the Mliliwane Game Sanctuary, Reilly's Rock's unique lodge has been tastefully decorated in keeping with its colonial roots by Swaziland's leading conservation team. Notwithstanding the necessary subtle additions and renovations, the house still stands as it was built almost a century ago. Mliliwane Game Reserve is Swaziland's pioneer conservation area and is situated in a beautiful, secluded sanctuary in Swaziland's Valley of Heaven, the Ezulwini Valley, an area between Mbabane and Manzini. After breakfast we depart Reilly's Rock and travel through rural Swaziland to the Ghost Mountain Inn, which is situated in the town of Mkuze. At the foot of the legendary Ghost Mountain lies the Ghost Mountain Inn, a perfect setting for taking time out to relax and experience the charms of Africa in comfort and style. The Inn has 52 tastefully appointed, en suite bedrooms complete with television, telephone and air conditioning where one can take in the golden African sunset from your very own garden patio. This afternoon we depart for the nearby Zimanga Game Reserve for an afternoon game drive, where after we return to the hotel. Today we enjoy and early morning 3-hour hide session at Zimanga and then an afternoon hide session at the other hide. You may also opt to do another game drive instead of a hide session. This morning after breakfast we make our way to the nearby Mkuze Game Reserve. A place of great beauty and high contrasts, Mkhuze is renowned as a mecca for bird lovers, with more than 420 bird species on record. 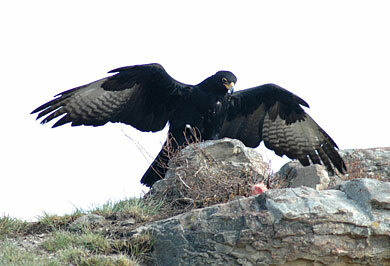 Visitors may enjoy excellent animal and bird sightings from the hides in the reserve, especially during the dry months. After our visit here we will travel directly to the "big 5" Hluhluwe iMfolozi Park where we would spend two nights at Hilltop Camp. The accommodation here is in brick under thatch chalets, each bedroom having its own private bathroom/wash-basin and toilet. 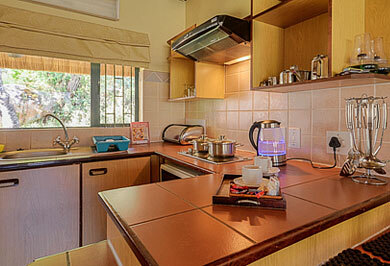 Each chalet is also equipped with a fridge and tea making facility. Our game viewing commences immediately upon entering the gates into the Hluhluwe iMfolozi park. Today will be spent on extended game drives to various areas of the Hluhluwe iMfolozi Park, with an early start to make the most of the day and to possibly chance upon one of the predators returning to their day-time lair. Set in the heart of Zululand, this is the oldest game reserve in Africa, where Zulu kings such as Dingiswayo and Shaka hunted and put in place the first conservation laws, where today the "big five" of African legend stalk the verdant savannah. Established in 1895, game viewing is the prime attraction. This morning, more game viewing follows as we leave the Hluhluwe uMfolozi Park to arrive in time for lunch in St. Lucia. We will check into our lodge and then visit the eastern shores of Lake St. Lucia, heading to Cape Vidal, game viewing all the while. After a visit to the beach we would continue on the circular route for a game drive before returning to our lodge. Animals that may be seen here include kudu, reedbuck, zebra, waterbuck and other antelope species, black and white rhino, elephant and on the odd occasion, leopard. We will overnight at Lidiko Lodge (or similar). Set above the Great St. Lucia Lake on a coastal dune, the main lodge offers bed and breakfast accommodation in well appointed air-conditioned en-suite garden rooms. All rooms offer a private patio and lead onto the tropical pool area and park like gardens of the lodge. After breakfast we will board a boat for a two hour cruise on the lake in this proclaimed World Heritage Site. Here you are guaranteed to see hippos, and a very good chance of seeing crocodiles and a vast array of bird-life. The iSimangaliso Wetland Park has both one of the largest estuary systems in Africa and the continent's southernmost coral reefs. In granting it World Heritage status in 1999, the World Heritage Committee noted the park's "exceptional biodiversity, including some 521 bird species". Situated on the central Zululand coast of KwaZulu-Natal, the park is made up of 13 adjoining protected areas with a total size of 234 566 hectares. Its remarkable biodiversity is a result of the park's location between subtropical and tropical Africa, as well as its coastal setting. The iSimangaliso Wetland Park has its origins in the St Lucia Game Reserve, declared in 1895 and made up of the large lake and its islands. St Lucia Park was proclaimed in 1939, containing land around the estuary and a strip of about one kilometre around most of the lake shore. This afternoon you arrive in Durban and overnight at one of the many hotels in Durban. We will collect you from your overnight accommodation or from the King Shaka International Airport in Durban and travel on the edge of the "Valley of 1000 Hills" and then past the capital city of Pietermaritzburg onto the "Midlands Meander". The Midlands Meander is what weavers, potters, woodcrafters, leather workers, artists, metalworkers, box makers, herb growers, cheese makers, beer brewers and pianos have in common. You will find them all, and a great deal more on the Midlands Meander map - South Africa's first, largest and most popular art and crafts route. From a very small beginning, the Midlands Meander has grown to well over a hundred stops on four routes. Originating with the arrival of the first settlers in the early 1800's the area boasts many wonderful homes and barns, an attraction to lovers of architecture. As you tour the Midlands Meander you will also notice that this area is home to a number of the country's most famous schools. From here we travel inland, to the foothills of the Drakensberg Mountains on the scenic route through the frontier towns of Bulwer, Underberg and Himeville, where we overnight at Moorcroft Manor. Moorcroft Manor offers classically decorated rooms all with bathrooms en suite. Selected satellite television, ceiling fans, hairdryers and robes are available in all their rooms. The remainder of the afternoon you are at leisure. This morning we transfer to our 4X4 vehicles for the ascent up the Sani Pass and into Lesotho. Breathtaking scenery and alpine conditions dominate this truly magnificent corner of this province. The Sani Pass is a spectacular mountain road that is a well-known entry point into Lesotho from South Africa's Natal Drakensberg Park. It is the gateway to the 'Roof of Africa' scenic route that links the spectacular scenery of the Drakensberg with the mountains of northern Lesotho. The Sani Pass is the only border post between Kwazulu-Natal and Lesotho. The Sani Pass was once a rough mule trail descending the Eastern Highlands of old Basutoland into Natal. Tough drovers brought wool and mohair down the Pass on donkeys and mules to be exchanged for blankets . clothing . maize meal . the essentials for life in a remote, impoverished country. And a young man had a dream . of operating a motor vehicle service up this fantastic Pass, using the 4-wheel drive vehicles he had seen on service in World War II. The Sani Pass was born. Once we have entered Lesotho we will stop off at a Basutho village where one can learn more about the life of these very friendly people, in this, one of the world's poorest countries. 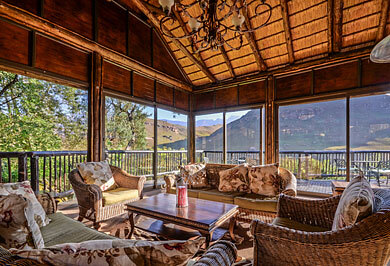 Lunch will be at the "highest pub in Africa", the Sani Top Chalet, for your own account. We will also have some time here to walk along the edge of the escarpment for stunning views into KwaZulu-Natal, before descending the pass to Moorcroft Manor. After breakfast, we travel to the Giants Castle which is the home of the eland and the majestic bearded vulture and lies in the Central Berg region of the Ukhahlamba Drakensberg Park, a World Heritage Site that takes its name from the silhouette of the peaks and escarpment that resemble the profile of a sleeping giant. 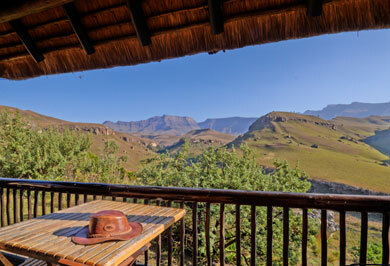 The camp is situated on a grassy plateau among the deep valleys running down from the face of the High Drakensberg, offering glorious views for hikers and mountain climbers. This afternoon you are free to explore some of the shorter hikes at your leisure. This morning after breakfast, we follow the signposted path to the Main Caves and approximately 2,5 km from the camp the path enters a beautiful forest below the cave sandstone overhangs, which shelter the Bushman museum. Several deep clear pools are to be found in Two Dassie Stream which runs through the forest along this route and swimming is a pleasant activity on a hot day. We continue on up the boardwalk into the Main Caves Bushman Museum. The guide on duty opens the entrance gate and he will give us an interesting talk of the early inhabitants of this area. We leave the museum and head to "Rock 75" which indicates the site of Col. Durnford's camp. It was here that members of the 75th Regiment camped in 1874 during the Langalibalele rebellion. It is believed that during their stay (June-September 1874) the regimental cook carved into this rock the figures "75" indicating that the 75th had occupied the spot. Upon arriving back at the camp we will depart for Johannesburg arriving late afternoon where we drop you off at your overnight accommodation or at the O R Tambo International Airport for your flight.